Thoughts of ordinary names never entered our minds when we had children. Our children weren't common. They were gifts from heaven - nothing short of the miraculous - and their names would reflect our hopes for their future. God names us, too. He calls us by a name that reflects His purpose for us, our heavenly character. 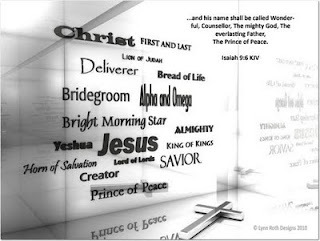 He's done this since the beginning of time: Abram (exalted father) became Abraham (father of multitudes), Sarai (contentious) became Sarah (mother of nations). He renamed Jacob (holder of the heel) Israel (God contented), and changed Saul (prayed for) to Paul (humble). Do you wonder what God calls you? 3. Jesus, Yeshua, Emmanuel (God with us). For Jesus is my salvation, mercy with a face, my holiness, and worthy of all praise! "Salvation has a name, mercy has a face. Holiness was crucified and He rose to give us grace. Jesus our holiness,worthy of all praise!" What are you thankful for today? I can so relate! My four blessings were extraordinary not ordinary. The fourth is Carynne (pronouced Kah-Rin) - enough said. Love this post - thank you! Thanks for stopping by, Shannon. You've chosen beautiful names for your extraordinary blessings! "You is Kind. You is Smart. You is Important." I Got This One, God! Dawn Aldrich 2008. Picture Window theme. Powered by Blogger.